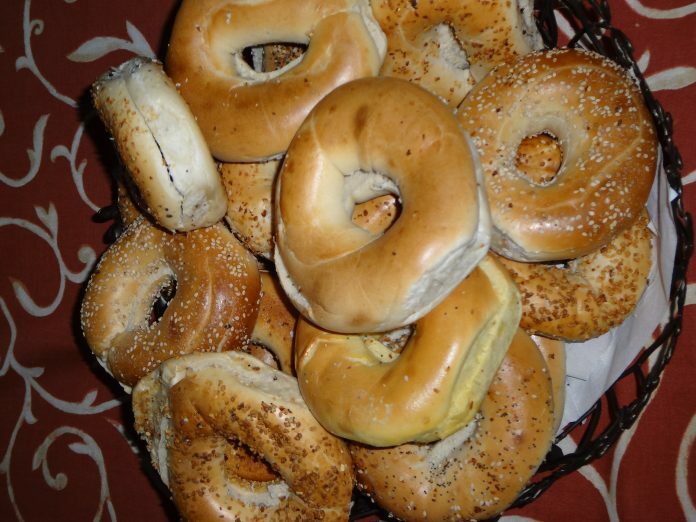 In 1986, Murray Lender (of Lender’s Bagels) declared July 26 to be National Bagelfest, and thus it has been ever since. That simplifies my breakfast options for the day. Now, as I have said before, bagels should be eaten on the same day they were made, and unfortunately that can never be true of Lender’s and similar prepackaged supermarket bagels (whether frozen or not). Indeed, I have a hard time thinking of prepackaged “bagels” as bagels at all. So if conditions permit, I urge you to seek out and consume a freshly boiled and baked bagel, without the superfluous toasting (because fresh bagels don’t need it, and it ruins their texture). If that’s not practical, well, it’s like your mom always told you: just do the best you can. That’s all anyone can expect.